HANDLING INSTALLATION & FINISHING INSTRUCTIONS. We have been installing doors & supplying since 1990 in one way or another & to be honest have provided a pretty good service.The only problem we do encounter is the finishing of doors ,if you dont treat your door ie paint or varnish as soon as you can you will have problems with it swelling up & sticking. It is not the end of the world & be honest is always best , just call us & tell us & we will come & re-trim & check you have the best product for your door.We recently had one man whom hadnt painted the sides or top of he's wood front door after three years !! & had only slapped on two coats of a quick drying paint on the front & back , he was wondering why it was sticking? .Another customer had an interior door installed then had walls around it plastered & tiled , the door was surrounded by all the damp which caused it to warp & of course he hadnt painted it.These problems are easily avoided with a little common sense or ask us , we usually have the answer & solution. 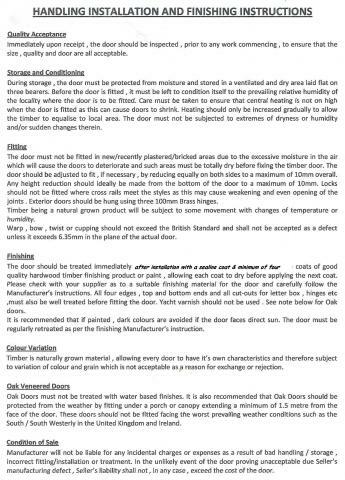 Below are handling instructions & a beginners guide to treating your doors , it may seem hard work but its not really just put the time in & your doors will last & look good. Failing that we do composite doors & upvc & even oak internal pre finished doors now.